On this date the British actress, producer, director, and translator EVA LE GALLIENNE was born in London, England (d. 1991). She made her stage debut in 1914 at the Prince of Wales Theatre in London. She was fifteen at the time. The next year Eva sailed for New York, and then on to Arizona and California where she performed in several theater productions. After traveling in Europe for a period of time, she returned to New York and became a Broadway star in several plays including Arthur Richman’s Not So Long Ago (1920) and Ferenc Molnár’s Liliom (1921). Disillusioned by the state of commercial theater in the 1920s, Eva founded the Civic Repertory Theatre in New York, with the financial support of one of her lovers, Alice DeLamar, a wealthy Colorado gold mine heiress, whose support was instrumental in the success of the repertory theater movement in the U.S. In 1928 she earned a great success with her performance in Ibsen’s Hedda Gabler. The Civic Rep. disbanded at the height of the Depression in 1935. Eva never hid her Lesbianism inside the acting community. In early Hollywood and acting circles, Lesbianism was fairly common, and although generally not divulged to the public, it was accepted behind the scenes. 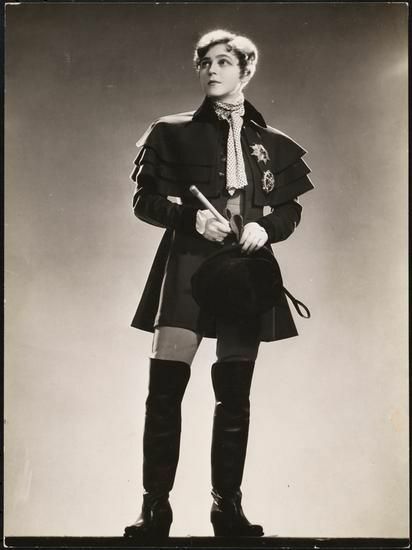 Le Gallienne was very protective of her private life, and although she had no problems with people inside the acting community knowing her sexuality, she was very opposed to anything going public. During those early days of her career she often was in the company of outspoken and bisexual actress Tallulah Bankhead and actresses Estelle Winwood and Blyth Daly, with the four of them being dubbed “The Four Horsemen of the Algonquin,” referring to the Algonquin Round Table. Her lovers included the great actress Alla Nazimova (at the height of her fame), Bankhead, Beatrice Lillie, Laurette Taylor. Her only heterosexual relationship seems to have been with the actor Basil Rathbone. She was later involved with the writer Mercedes de Acosta and palled around with Natalie Barney. De Acosta wrote two plays for Eva during that time, Sandro Botticelli and Jehanne de Arc. By early 1927, Eva was involved with the then married actress Josephine Hutchinson. Hutchinson’s husband started divorce proceedings and named Le Gallienne in the divorce proceedings as “co-respondent”. The press began accusations that named Josephine Hutchinson as a “shadow actress”, which at the time meant Lesbian. Five months later, Le Gallienne performed in the daring play about Emily Dickinson, entitled Alisons House. The play won the Pulitzer Prize that year. She appeared on the cover of TIME magazine and during the Great Depression she was offered directorship of the National Theater Division of the Works Progress Administration by President Franklin D. Roosevelt. She later co-founded the American Repertory Theater, which operated from 1946 to 1948. In 1964 Le Gallienne was presented with a special Tony Award in recognition of her 50th year as an actress and in honor of her work with the National Repertory Theatre. Although known primarily for her theater work, she has also appeared in films and television productions. She earned an Oscar nomination for her work in Resurrection, for which she gained the honor of being the oldest Oscar nominee up to that time (1980) ; and won an Emmy Award for a televised version of The Royal Family after having starred in a Broadway theatre revival of that play in 1976. The National Endowment for the Arts recognized her with the National Medal of Arts in 1986. She died at her home in Connecticut of natural causes at the age of 92.